Emeritus Professor T.G. Kulatunga who had served the Sri Jayewardenepura University from 1967 to 2008, said the Mannar mass grave was the result of a massacre committed by King Pararajasekaran to punish the people who converted to Christianity. He said this incident needs to be thoroughly researched to ascertain all related facts. According to Prof. Kulatunga, King Pararajasekaran had ruled the Jaffna Kingdom. Portuguese historical records mention this mass massacre. People of all age groups and of both sexes – the aged, elders, adults, youths and children – were massacred due to their conversion to Christianity, in this incident. Prof. Kulatunga said it could be ascertained that this barbarity had been committed in the 1550s, according to Portuguese, English and Tamil historical records. The coastal belt of the country had fallen under Portuguese rule between 1505 and 1658. During the 1540s, various efforts were made to convert Hindus to Christianity. Hindu rulers were completely against these moves. There are accounts of their opposition in Portuguese records. Historical evidence is contained in the book, Chapters on the Introduction of Christianity to Ceylon which is the English translation of the Portuguese book, Conquista Espiritual Do Oriente by Paulo Da Trindade written in 1638. The part relevant to Sri Lanka had been translated to English by then Chilaw Bishop Dr. Rev. Edmund Peiris and a Christian lecturer from Bangalore, A. Meersman. The book was published by the Colombo Catholic Church in 1972, with the title, Early Christianity in Ceylon – A Seventeenth Century Narrative. Atrocities faced by the Portuguese in their attempt to convert people to Christianity is mentioned in the book. The records can be found in pages 176 - 179. It says 600 persons who embraced Christianity under the leadership of Christian missionary Francis Xavier were massacred by King Pararajasekaran. It also says that he killed Christian priests after chopping them with his sword. Three pictures of massacres are also included in the book. It says the massacre occured at a place named ‘Patin’ and later, the place was named as the ‘Valley of the Martyrs’ to commemorate the incident. It also says then Portugal ruler in Goa in India, Constantino De Braganza made a request from the then Portugal King (Viceroy) to punish the Jaffna ruler for the massacre, but it was not successful. As a result, he left to Jaffna from Goa with an Army on September 7, 1560. The book does not say anything about the result of the journey. German priest Joseph Vicky said in his document, which is in German, that the massacre took place in 1544. In 1670, a Portuguese Christian priest who arrived in India had mentioned the same incident in his book. Under the request of the Dutch, a Tamil scholar, Mailvaganam Pulavar had come to Jaffna and wrote about its history in Yalpana Waipawamalai in 1739. This massacre is mentioned in his book. It says that King Sangili killed 600 persons who converted to Christianity. Another set of historical documents says that when the Dutch captured the Mannar Fort after defeating the Portuguese, they took 200 persons into custody. Nothing was mentioned about the fate of those prisoners. According to reliable historical records, a similar massacre of people who had converted to Christianity had taken place in Japan, during the same era. An archaeology professor in the Kelaniya University said the skeletal remains had been placed in an orderly manner, while in other places they have been placed randomly. 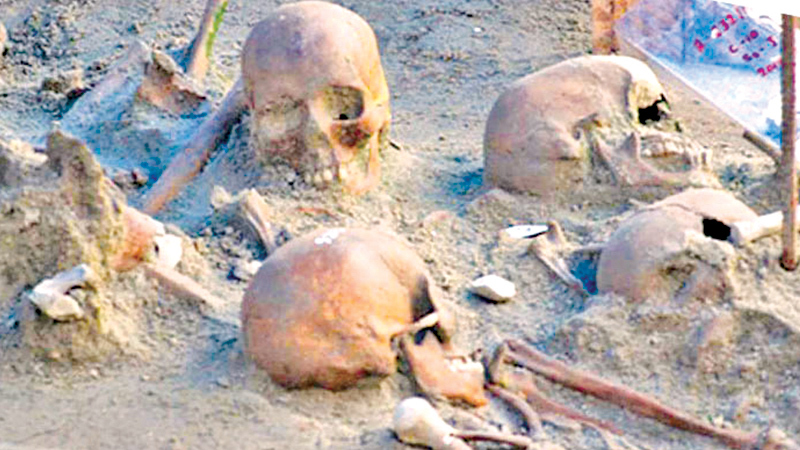 According to Consultant Judicial Medical Officer and Forensic Specialist Dr. Saminda Rajapaksa, results of the radiocarbon dating tests carried out by Beta Analytic in Miami in Florida, on the bone samples recovered from the mass grave in Mannar reveal that the samples are of people who have died 350 to 600 years ago. The samples were obtained from skeletal remains of six human bones found in the mass grave. Dr. Rajapaksa said the relevant reports were presented to the Mannar Magistrate’s Court. He said Florida laboratory has been requested to submit the date of the investigation report in writing to the Mannar Magistrate’s Court. The mass grave in the former war zone was discovered in March, 2018, by workers constructing a SATHOSA building. Excavation in this place began on the orders of the Mannar Magistrate in March, last year and investigations have been continuing under the close supervision of experts in Judicial Medicine, Archaeology with the assistance of Government Analyst. A total of 323 human skeletal remains were found, including the skeletons of about 28 children. The fragments were sent with a forensic expert to Beta Analytic on January 23 for the Carbon 14 test to determine the date of death. According to the report, the samples from the mass grave belong to the period 1400 AD to 1650 AD. Mannar Magistrate T. Sarvanarajah ordered that the report be made public when the case was taken up following a motion filed by the relatives of missing persons in Mannar. Although the Magistrate’s Court officially received the relevant scientific report from Beta Analytic, the court had also requested an official description of the relevant data from the company. Bone parts of 325 persons including 29 children have been found at the grave site. The samples were taken in the presence of a team of Judicial Medical Officers, Senior Professor of Archaeology Prof. Raj Somadeva, officials attached to the Office of Missing Persons, the Government Analyst and relatives of missing persons to ensure transparency, on the Magistrate’s order. Tamil National Alliance (TNA) MPs pointed out the importance of sending another set of samples from the Mannar mass grave to a laboratory in another country for carbon dating. ‘We accept the report from Beta Analytic in the US, but given the importance of the Mannar grave, we need to get a second opinion,’ they said. “No action had been taken when 96 skeletons were found in a mass grave in Thiruketheeswaram in Mannar in Mannar in the past. The Archeological Department stated that the Thiruketheeswaram grave site was an ancient one. 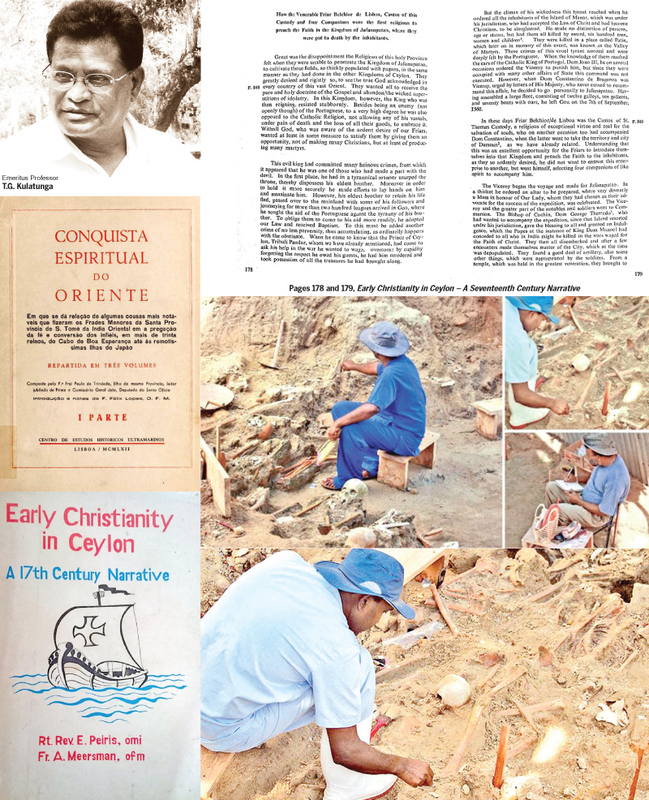 In the same manner, now the US is saying that the Mannar mass grave is also ancient. The lab in Florida had not performed further investigations to identify the victims and to determine the identity of the skeletons. A large number of people went missing in Mannar during the war. The excavations at the mass grave site should be expanded. Further tests should be conducted to identify the victims,” the TNA said. Carbon dating is a method for determining the age of an object containing organic materials by using the properties of radiocarbon, a radioactive isotope of carbon. Carbon-14, or radiocarbon, is a radioactive isotope of carbon with an atomic nucleus containing six protons and eight neutrons. The radiocarbon dating test was pioneered by Willard Libby and his colleagues to date archaeological, geological and hydrogeological samples.